Have you looked at your involvement with a manipulative, abusive partner and asked yourself, “How did this happen?” That’s exactly the question that I answer in my webinar, Sociopathic Seduction: How you got hooked and why you stayed. If you haven’t checked out our online webinars, I’m going to make it easy by featuring one program every week in the Lovefraud Blog. Something is very wrong with your romance. In the beginning, your partner was charming, loving, attentive and promised that the two of you would live happily ever after. Now, he or she ignores you, exploits you, rages at you, or perhaps even assaults you. Scientists once thought our genetic blueprint was carved in stone — whatever we inherited from our parents was with us for life. Research over the last few years, however, indicates that this is not the case. 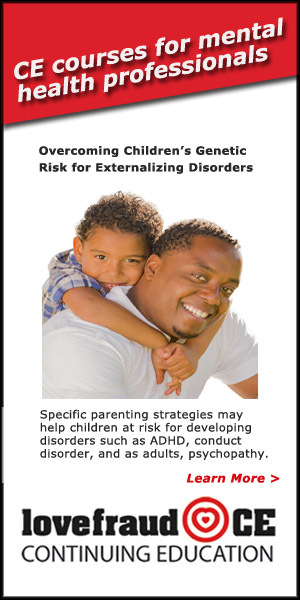 Genes can be modified by experience through processes referred to as “epigenetic.” This is especially true during childhood. Recent research shows that childhood events, such as the family’s socioeconomic status or the absence of a parent, can alter genes responsible for regulating inflammation. Experiences in childhood can alter your DNA for the rest of your life, on ScienceAlert.com. “This is the most ridiculous thing I’ve ever seen,” responded one of our readers. I agree — tapping does look ridiculous. My email included the above video of the instructor, Stacey Vornbrock, and me tapping on our faces with our fingertips. But guess what — EFT Tapping works, as numerous scientific studies have found. 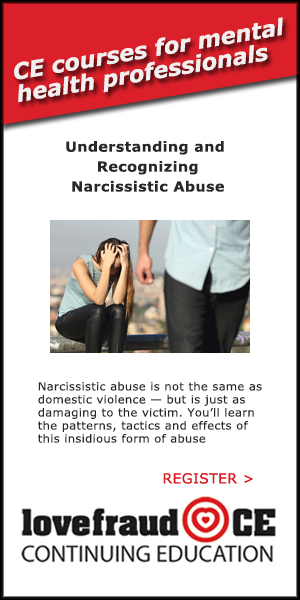 Are there warning signs that a romantic relationship will turn abusive? Emphatically YES!! 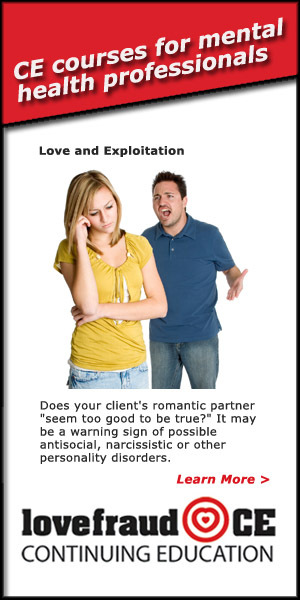 Lovefraud has been saying this for years, and Dr. Dina McMillan, a social psychologist, agrees. 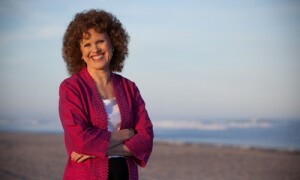 A Lovefraud reader sent me the above video of a TEDx Canberra presentation by Dr. McMillan. She says that about one in three teenage girls and women endure physical or sexual abuse from a romantic partner at least once in their lives. That adds up to 1.16 billion people. And it doesn’t count those who suffer emotional and psychological abuse, but no physical abuse. I am so excited. 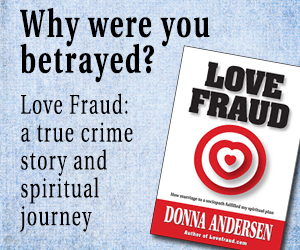 Now, Lovefraud offers you a way to relieve all the painful emotions that result from tangling with a sociopath — betrayal, despair, anger, guilt, shame, grief, disappointment, depression, even PTSD. Yes, I said even PTSD. 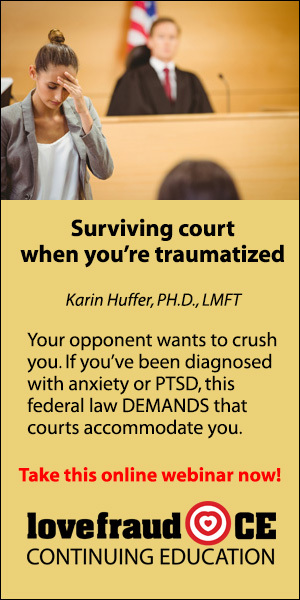 In fact, this technique is being used to help combat veterans suffering from PTSD. It can help you. For years, I have been recommending that Lovefraud readers check out EFT Tapping (Emotional Freedom Techniques). Now, Lovefraud offers you a webinar on tapping that is specifically designed to teach you how to recover from a sociopath. Love fraud is really scary stuff. 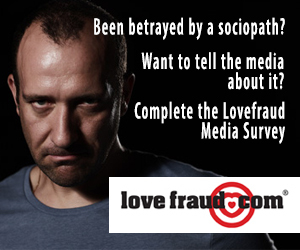 But here’s the good news: Love fraud is totally avoidable, IF you know what to look for. So I love teaching people how to spot and avoid love fraud. I know that just a little bit of education can make a tremendous difference in someone’s life. Presented by Megan Lyons, Esq. Sometimes sociopaths will not leave you alone. The involvement is over and you want to move on, but the sociopath is stalking you. 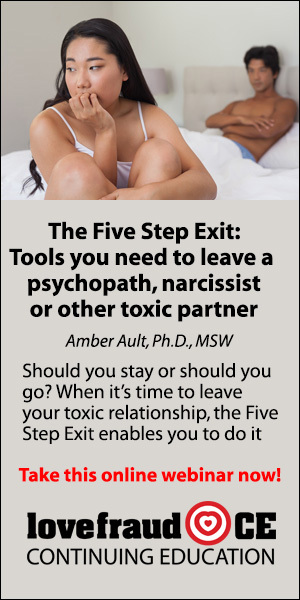 Or, you can’t totally escape the person — perhaps you have children together — and the sociopath uses every communication and exchange as an opportunity to harass you. Is a tumultuous relationship love or exploitation? 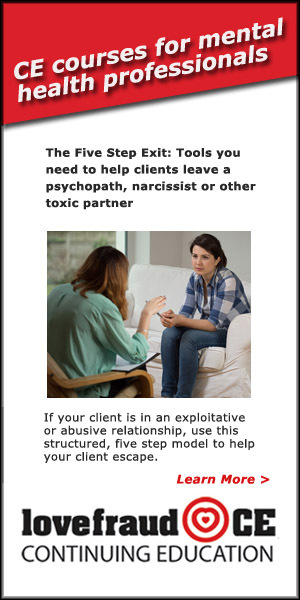 Part 1: Recognizing the exploitative relationship and its impact on the intimate partner — available on demand at Lovefraud CE. 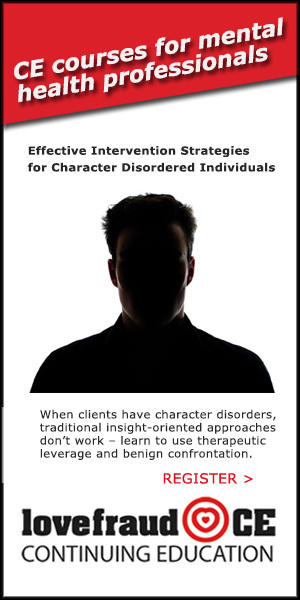 Part 2: Overview of therapeutic strategies for partners in relationships with exploiters — Live online webinar on Monday, July 24, 12-2 ET. 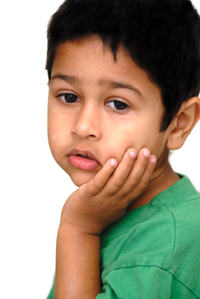 When someone is involved in an abusive relationship, the most prominent warning sign is likely to be confusion, explains Mary Ann Glynn, LCSW, CHT. 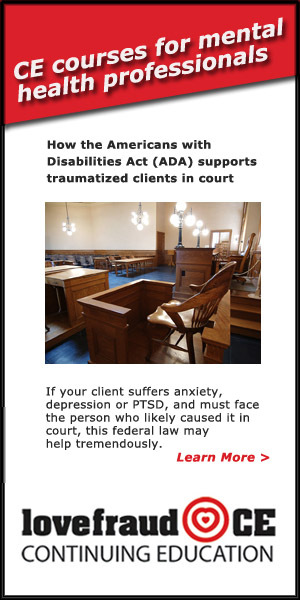 People who are involved with abusers can’t figure out what is going on — and sometimes counselors misinterpret their clients’ confusion. 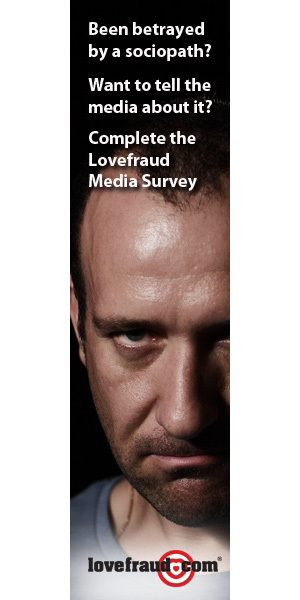 New Lovefraud Continuing Education Webinar! Presented by Megan M. Lyons, Esq. The sociopath won’t leave you alone. He or she is harassing you, stalking you, perhaps threatening you. You want a court order to make the abuse stop. How do you get it? But even more importantly, should you get it? These are the issues that attorney Megan M. Lyons will address in her new Lovefraud CE webinar, Obtaining Injunctions Against a Sociopath. 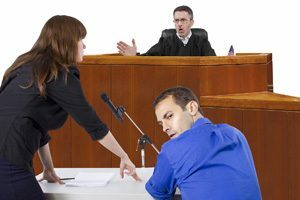 If you’re thinking about pursuing a restraining order, you need this information.